Noooooo jwells. YOU ARE THE MAN! Make sure you got the latest. I updated it again after I posted. The only thing I see missing is the hole diameter (.125 in.) in section D-D.
That's some nice work, just the way I like. I fixed it. Thanks for pointing that out. The link should now be updated. Thanks. That would be helpful. Good luck on the new build. Question Terry .................. If I get this printed actual size, will the body outline and all dimensions be actual size? Question Terry .................. If I get this printed actual size will the body outline and all dimensions be actual size? Yes, that was my intention. I scaled to print 1:1 to a D sized drawing. If you get someone like Kinkos to print from this and the scale factor is set to 1:1, you should be fine. 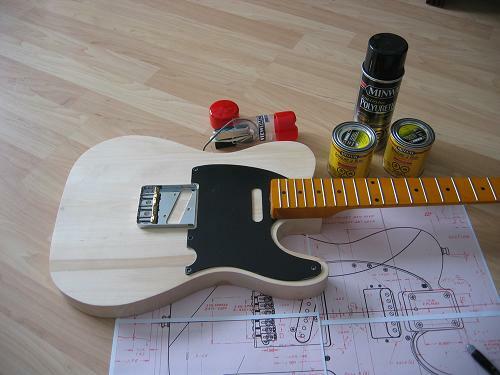 I'd recommend laying a Tele bridge over the hole pattern to check. I printed 1:1 on an A sheet and the bridge area came out accurate. Don't select a "fit to margins" option. I use Draw Plus to work with these drawings and print them. I overlapped Terry's drawing over mine and it fits perfectly. It means it will print perfecto because I already used mine to build a few Teles. And with Cad type of files you can't go wrong anyway. So what I do is I set the program to print Poster size on 4 sheets of normal letter size paper, and assemble them together after that. No need to get them printed elsewhere. Yes, many thanks to Ed and YOU eryque for connecting me into this. What is Ed's nick here on the TDPRI? For those of you that didn't read some of the other posts, I was given a drawing with the wonderful profile. Ed did a great job on this. It appears to be very accurate. I later connected all the arcs and circles together so the area/volume could be calculated as shown below. Nice work! Thanks for that. Very cool. Thanks for the verification. That is outstanding work, Terry! his will come in handy for a lot of people. Thank you very much for your incredible effort! Thanks Tom, but the hard work was already done by having the profile. The rest is just some dimensioning and drafting work. Let me know if you see anything that needs to be changed. Terry, you are too modest. Other than that, the drawing looks great! Again, terrific job, and thanks. Just what I needed for a current project! I've discovered we've got a big A0 printer at work so I'm going to print a couple out!